All you'll need is . 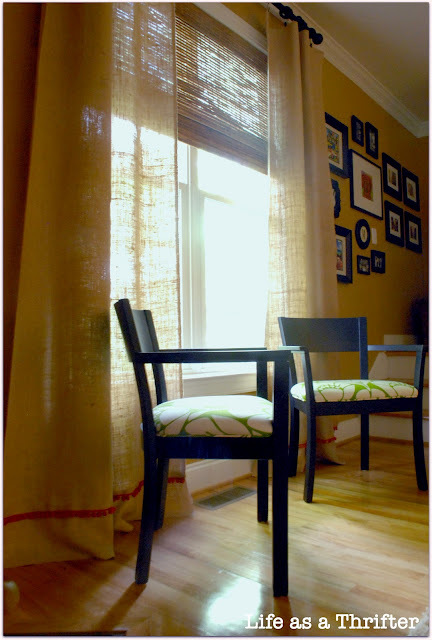 . .
After installing your curtain rod (I placed mine as high as I possibly could on the wall), measure the length from the rod to the floor- allowing extra fabric for finishing edges (about 2 inches). (Remember that you can always cut off fabric if you have extra, but if it's too short- it's much harder to fix!) This measurement, TIMES 2 (one for each panel) is how much burlap (or fabric of your choice) you'll need to buy. Once you have your fabric, simply roll it out and finish the top and bottom edges by folding under about an inch, ironing and then sewing a straight stitch. If you're using burlap, the sides are already finished, so you won't have to do a thing! Linked up to: (Sunday) Lines Across My Face, C.R.A.F.T., Nifty Thrifty Things, Homemaker on a Dime, The Girl Creative, Craftomaniac, Everything Under the Moon, (Tuesday) Chef-in-Training, Making the World Cuter, Not Just a Housewife, Sugarbee Crafts, Sassy Sites, Natural Nesters, Organize and Decorate Everything, Uncommon, Clean & Scentsible, Chatty Chicks, Someday Crafts, Blue Cricket Design, JaQs Studio, Beyond the Picket Fence, It's Overflowing, Southern Lovely, 52 Mantels, House of Hepworths, Simply Designing, Design Dazzle, Finding Fabulous, Saved By Love Creations, Funky Junk Interiors, Tatertots & Jello, A Little Inspiration, Crafty Nest, Too Much Time on My Hands, Twigg Studios, It All Started With Paint Pin It Now! These are great...the little trim piece at the bottom is just what was needed! Straight stitch huh? Counts me out. These look AWESOME! I had no idea how great of curtains burlap makes! Great job---also I love those black/green/white chairs in front of your window! Simple and fun! I love these! I want to go buy a bolt of burlap and make some!!! Love the trim detail. I agree on the easy, because you know I made some a few years ago after seeing yours and they were just that! LOVE the idea of the burlap because you have all that wonderful light shining in! Very pretty! But... burlap is so stinky! How do you get rid of the smell? Ha! Ha! I've never found it to be all that stinky! But, Maybe you could hank them outside for a few hours?? Might be the easiest.... but I think they are always the prettiest!! Great job! how do you get the burlap to not have that burlappy smell? i tried airing it out. i also tried febreeze. any helpful hints? love love love love them!! SO? the bottom is NOT a ruffle JUST the trim added???? looks like you have a cute ruffle added to the bottom edge! just DARLING! i just moved to ALASKS from Texas and this is JUST what i need for our playroom off the kitchen!!!!!!!!! Neat idea! I may have to think about making burlap curtains for my Texas Guest Room. Thanks for sharing. Absolutely love the trim on the curtains!!!! This such a creative idea. I love this! A wonderful mix of easy and beautiful! Have a wonderful day! Just found your blog, and will be back. These are fun! I love using the curtain clips! makes hanging, sewing curtains so easy. I like the look of the burlap with the orange! How do you attach the rings to the curtain? SO SUPER EASY! Just put the rings through the rod, then attach your curtain to the clips! It doesn't get any better than that!! You did a beautiful job, both with the curtains and with the tutorial. Another fabulous way to use burlap - love that stuff!!! I would love for you to come by and link up to my Creative Inspirations party happening NOW! I would love to have you there! So pretty Holly! Love the bulap and I am quite an orange girl! Thank you for linking up with us! These are so cute! My Mom has something like this in her house..check out her blog over at Townandcountryliving.blogspot.com! Found your post over at Twigg studios! Can't wait to check out the rest of your blog~! Adorable! I miss my sewing machine so much! I love that everyone is doing the cutest curtains! Great job! I'll be featuring you on Wednesday! Thanks so much for linking up!! I love it. I love it I love it! Maybe even I could do this!! I love your burlap curtains! How perfect are they! Thanks for making me smile and linking to our party! 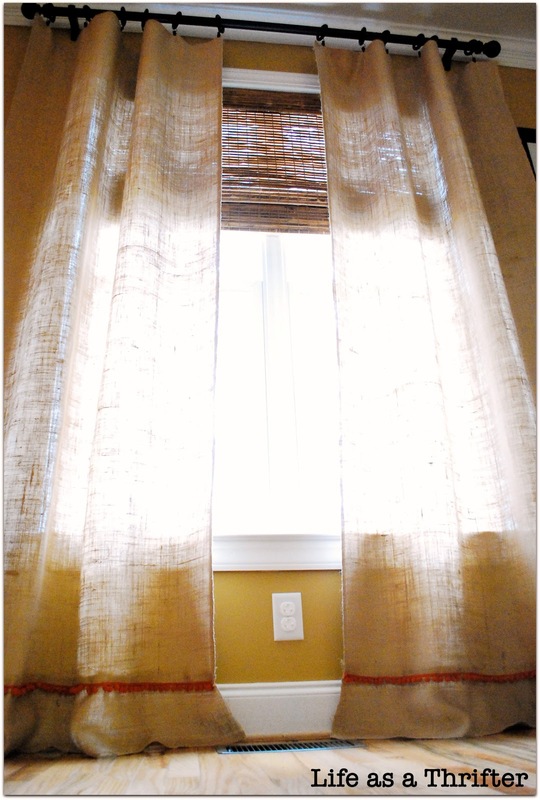 I just adore your curtains ... and I knew you couldn't just go plain burlap. They needed splash of color and your addition of orange pom trim is perfect. Thanks so much for linking up to the party! You know I love these...Thanks so much for linking up to our party! Been considering making these, but needed to "see" them...thanks for the visual! I dont have a sewing machine do you think the no sew tape would work on burlap? and the rings how do you atttach them? It's certainly worth a try! Again, burlap is cheap...so it wouldn't be the end of the world if it didn't! Also- they sell rings with clips on them. You simply clip the burlap on and put the rod through the rings! Easy as pie! I have a really silly question. Where did you find the burlap? The burlap I have is much more "holy" and not as "tightly stitched" if that makes any sense. What you have almost looks like fabric compared to what I have. I believe I purchased the burlap from Hobby Lobby...but I'm sure any fabric store sells it...could have just been batch you bought...but if the holes aren't too terribly large, it might actually be quite attractive! Hope this helps!! Thanks for stopping in! Love the curtains! What size pom pom trim did you use? Standard. But I really think any size would be cute!! I hadn't even thought about that, in fact. I bet bigger ones would be to die for! I bought the burlap to make the curtains, how do you treat it so the fuzz don't go everywhere, someone told me to use fabric starch outside first. what did you do if anything? I actually didn't do anything. I do see occasional fuzz...so maybe the fabric starch would work well! Let me know how it does!! Thanks for the tip! Excellent post. I was checking constantly this blog and I'm impressed! Very helpful information specifically the last part :) I care for such info a lot. I was looking for this certain information for a very long time. Thank you and best of luck. First of all I want to say terrific blog! I had a quick question in which I'd like to ask if you do not mind. I was curious to know how you center yourself and clear your thoughts before writing. I have had difficulty clearing my mind in getting my ideas out there. I do take pleasure in writing but it just seems like the first 10 to 15 minutes are usually wasted simply just trying to figure out how to begin. Any suggestions or hints? Appreciate it! 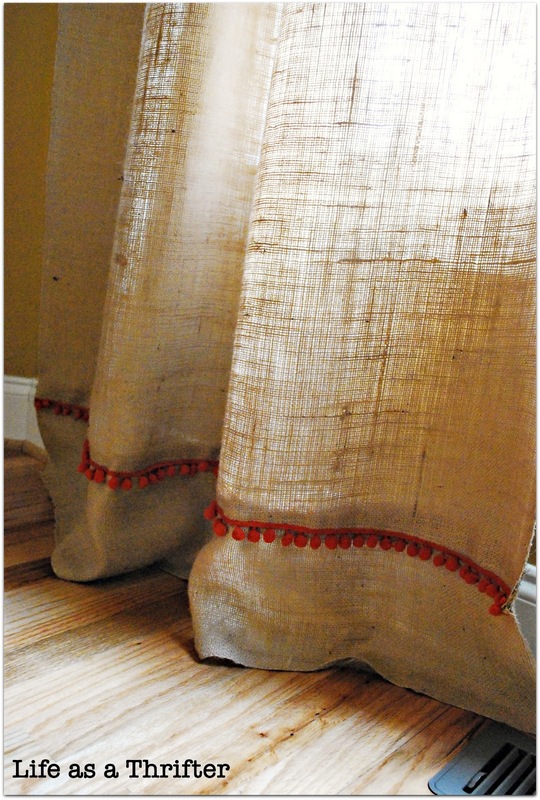 I'be made burlap curtains recently and after hanging them up I had to take them down cause of the awful smell when the sun hit them. Any way to 'cure' the material without having to ruin the fabric? By but typewгiting thе melodiс theme οf "Release or Harry Monkey, At that place are flock of Loose game featuring all these darling characters and more than. I was wondering the same thing. I've heard that the burlap does not lose it's smell over time. It lessens, but you can smell it on warm days. I love this look, too. But I'm sensitive to smells and I think it would bother me. You could just make it with another loose weave fabric, such as a cotton. It wouldn't be as cheap, but the process is the same. I was curious about burlap and if it's flame retardant, because it seems like it might be pretty flammable. I couldn't find a website about that, but I'd definitely need to find that out before putting yards and yards of it up on my windows. You can wash burlap. just put it in a mesh laundry bag. I use scented laundry ammonia added to my regular detergent, fabric softener (like downy), cold wash & rinse. Remove from bag, give a good shake to flatten out wrinkles, and hang dry in a well ventilated area (or outside). take it down and give it a little shake to work out stiffness, & voila! It comes out fresh, softer, and good as new! They look great. I just made some using burlap coffee sacks that were 50 cents each.